The early bird catches the worm, or, in our case, the millipede. If you want to hike in Israel in the summer, you have to be up at the crack of dawn. We all woke at 3 am, even before the birds started chirping, and were on the road south to Meitar by 4am. We drove along empty road and saw the sun rise from the highway. We arrived at Kibbutz Amasa which is east of Meitar, and parked the car inside the gate. By 6:15, the morning air still fresh and crisp, we were on the trail. We adopted two dogs who ran alongside our hiking dog TJ. The dogs ran and played together, chasing after a fox and sighting a pack of white tailed deer. ​This 24-km section was well marked with the three-color shvil signs the whole way. 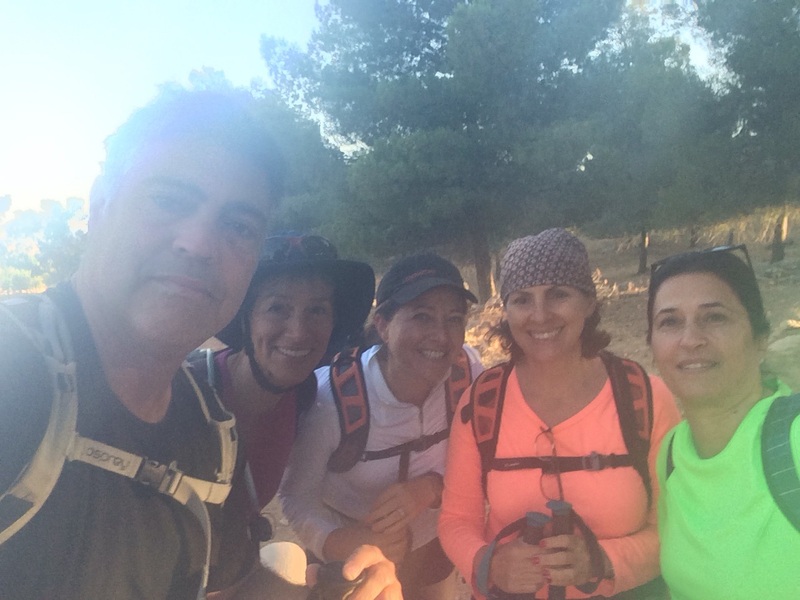 We started off in pine forests on a path with gentle rises and declines. We made our way up through thick shady pines of the Yatir Forest along a wide path perfect for mountain biking. We also saw many large millipedes on the path and wondered how they could survive the heat. 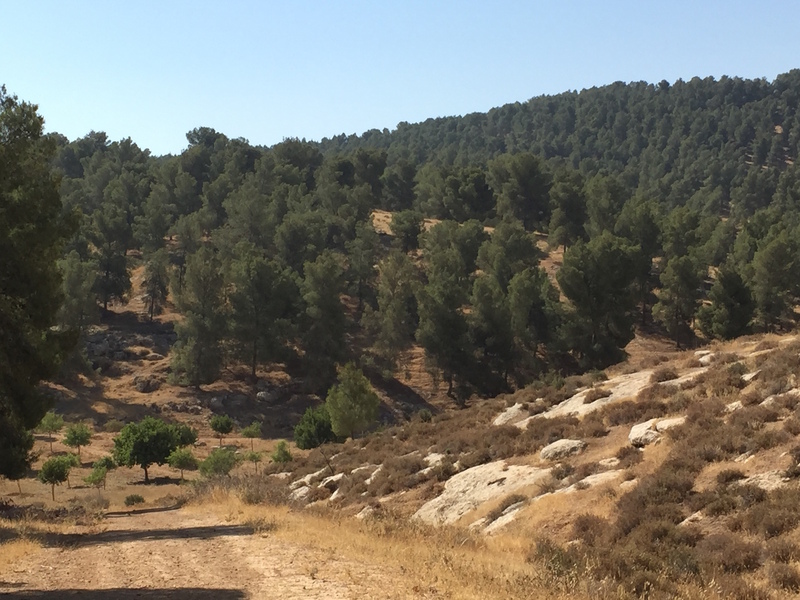 On these slopes, the KKL-JNF planted the largest area of forest in Israel, covering 10,000 acres with trees. They planted a variety of trees including eucalyptus, the Coral Gum and pistachio trees. 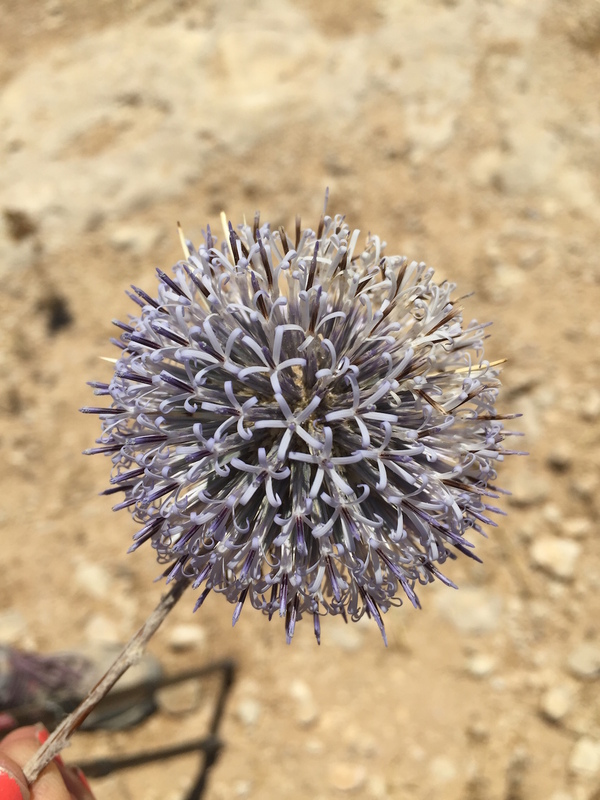 ​Along the way we had beautiful views of the desert to the south and west and the Hebron Hills to the north. We were away from roads and could hear nothing save for the breeze in the pines and the gravel below our hiking boots. Pure serenity. We came to a Bedouin tent, our first and only hint of human dwellings the whole day. A herd of goats was being guarded by fierce dogs who came after our dogs and chased the two kibbutz dogs away from us. 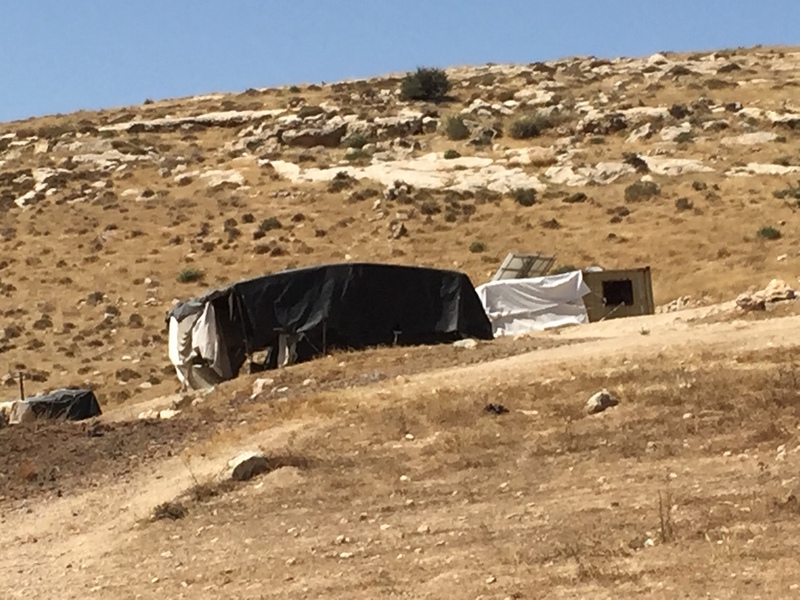 Spooked, they would not rejoin us and we hope they were adopted by the Bedouins as we cannot imagine them ever finding their way back. We were supposed to pass two Byzantine ruins along the way but saw no sign of them. 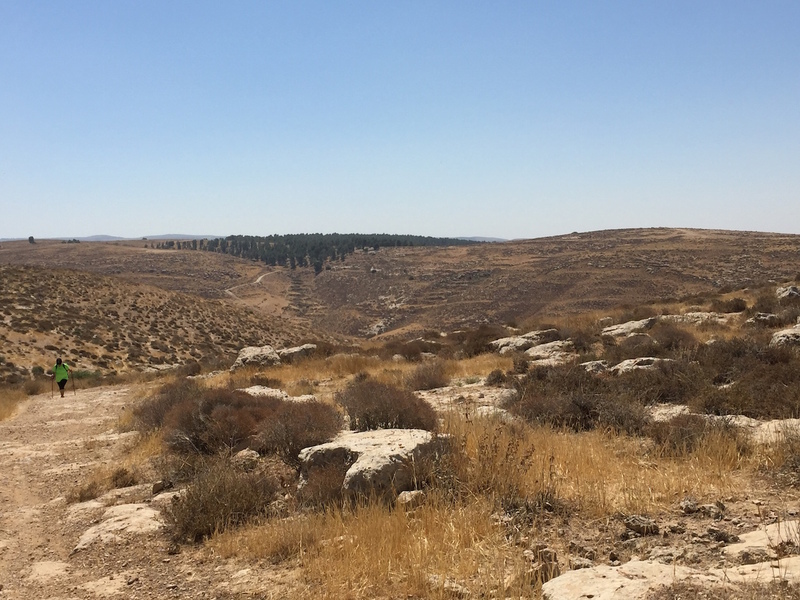 One is the Hiran Ruin and the other is the Yatir Ruins, which has been identified as the Levite town of Yatir and a city of refuge. Here are remains of two churches, olive presses, homes, burial caves and cisterns. We did see four white-tailed deer who shot across the path a breakneck speed. We also saw many black millipedes on the trail. We spent the hottest part of the day in full sun with little breaks. We could see where the trees dramatically stopped and endless desert began...the landscape of many future hikes. At one point the trail cut to the right into a forest where we saw a guard tower. An Arab was standing up there and his friends were picnicking below. 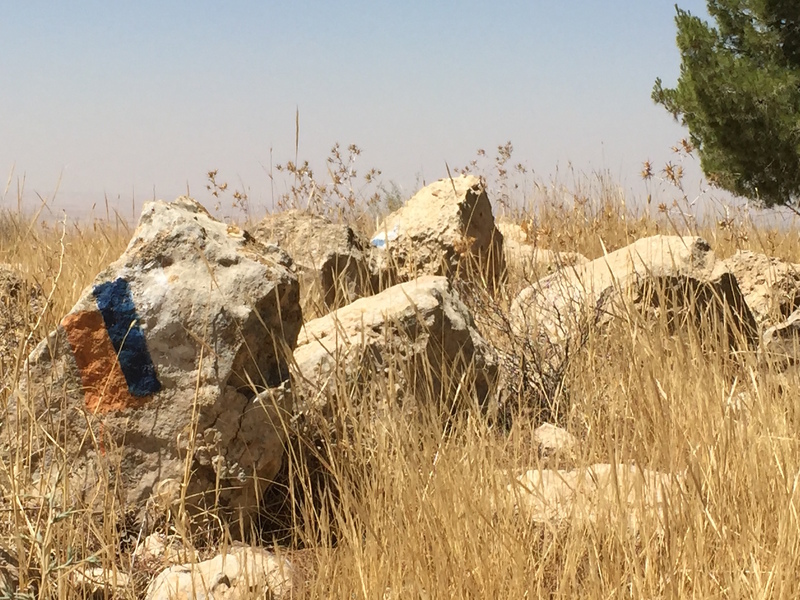 From 1948-1967, this was an active Israeli guard tower as the Jordanian border was very close by. Today, the forest is peaceful and quiet. For a while, we were walking within view of the security road on part of the trail and also passed vineyards planted in the desert. We assume these grapes are used at the nearby Yatir winery which will have to be a stop on our next hike. As were hiking at a higher altitude, around 600 meters above sea level and were in an arid area, the heat was not exactly intense. We had a breeze and the shade of the pines for a few hours. We stopped nearby the Foresterís House for lunch. This was a kind of fortress for the forest planters in the 1950s. 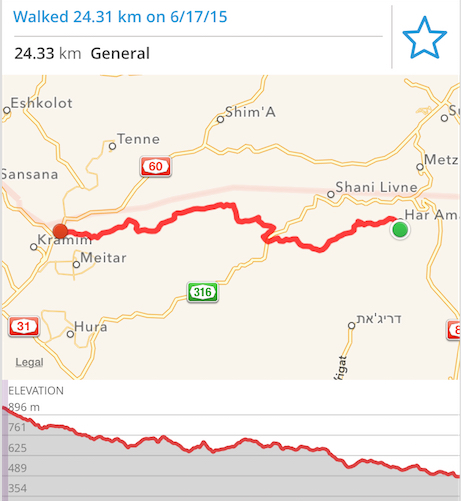 It now houses offices for the KKL and offers a place for Shvil Israel hikers to overnight. Below is a memorial with names of Italian Jews killed in the Holocaust. After lunch, we left the comfort of the shade and felt the sun more intensely. As we walked on, the dogs continued with us and we were feeling nervous they would never find their way back to the kibbutz. We exited the Meitar forest at Highway 60 beside a famous bridge. In 1948, the day after the Battle of Beersheva, the Israeli army was asked to blow up this bridge to prevent the Egyptians from crossing. The Captain of the unit was killed during this mission and the place bears his name: Dubenbaum Bridge.